In close combat much of a soldier’s brainpower is taken up with the basic functions of avoiding death and injury. Most soldiers are not keen on killing other people either, and have their perceptual and decision-making abilities degraded by stress and fatigue. Though blindingly obvious, these facts are usually overlooked in tactical doctrine, training and equipment development. Tactical psychology is the art and science of exploiting human weakness – encouraging the enemy to run, hide or surrender. When done correctly it increases operational tempo, saves lives on both sides and saves ammunition. It can stop a war descending into a quagmire. By developing the Brains & Bullets model of combat participation and providing human factors input to MOD studies, Wapentakes has built unrivalled expertise in identifying and quantifying critical aspects of tactical psychology. Human Factors input to Operational Analysis – a 1990s project that studied fear, surprise and shock. It aslo developed ShockSAF, which allowed computer-generated forces (bots) in training simulators to suffer basic suppressive fire and flanking effects. Tactical Psychology in Platoon Combat Experimentation (2014) – a Wapentakes study for the Defence Human Capability Science and Technology Centre. Found that the training systems used in PCE precluded adequate representation of suppressive fire and flanking effects. Also identified potentially severe limitations on current models of suppressive fire. Limited circulation report available on request. Updating STANAG 4513 (2015) – supporting Dstl’s revision of the NATO definitions of suppressive fire. Confirmed problems with suppression models likely to degrade the assessment of intermediate “universal” calibre weapon system. Limited circulation report available on request. Donkeys Led by Lions – A British Army Review article by Wapentakes associates on soldier burden. Moral and Morale – This doesn’t really count as work. It’s a failed bid to examine the link between legitimacy of a conflict and the combat effectiveness of soldiers. 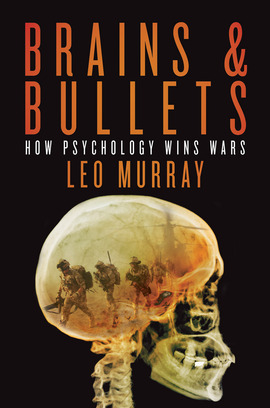 Wapentakes associates authored Brains & Bullets, the primer for tactical psychology. It contains the first coherent quantified model of tactical psychology and is being translated into a mathematical format suitable for coding into a commercial game. Have a look on Amazon, you might like it. 1. Soldiers from the 9th/12th Lancers and 2 Royal Anglian rest during an operation in Helmand (Crown copyright 2014). Fatigue and fear interact. NATO soldiers now carry record combat loads so they move slowly and have to use very high volumes of fire to make headway. 2. The M-67 flamethrower tank in action in Vietnam (Wikimedia Commons). Flamethrower tanks were terrifying but only really effective when combined with infantry using “carrot & stick” tactics. When this happened enormous numbers of enemy soldiers surrendered; when it didn’t a lot of villages were burned down. Modern weapons need to be combined with a carrot too. 3. A soldier of the US 12th Armd Div with captured German soldiers (Wikimedia Commons, NARA-535840). Even fanatics surrender if the right buttons are pressed. In WW2 the number of soldiers captured in contact was greater than the number killed. By 1944 psyop teams and infantry commanders had even worked out how to get German and Japanese elite forces to surrender in contact. The number of insurgents captured in contact by NATO forces in Afghanistan was so low that it was not worth keeping a record.